Time to play with these fun Scooby-Doo Playing Cards. 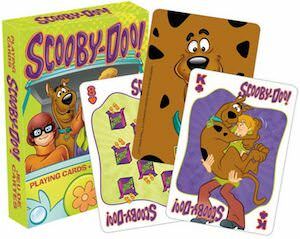 Playing cards are most times just way to boring but now you can have cards all themed around your favorite cartoon dog Scooby-Doo. Like any real deck of playing cards also this deck has 52 cards with 52 different images and the back of the cards has an image of Scooby-Doo himself on it but on the front you can find all fun things besides the values of the cards. A deck of card is easy to take so that you are always ready for a game of cards no matter where you are. Now is the time for a game of cards and you should be using the Harry Potter Crests Playing Cards. These playing cards do not have the normal spades, hearts and the others. 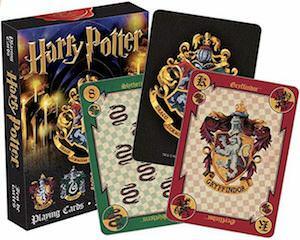 These cards have the house crests and colors and on the back of the cards you can find the logo of Hogwarts. So now you can play card games with your friends. Poker night will now have a Harry Potter theme all thanks to these cards. Now is the time to put away your phone and actually play cards because it is way more fun when hanging out with friends. 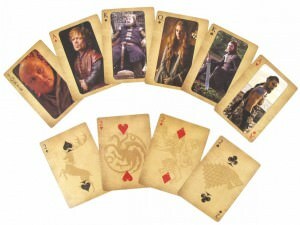 Followers of the TV series Game of Thrones and those who like to play card games can fulfill both loves with this deck of playing cards based on the TV show. Each suit in this deck of cards represents one of the houses in this show and has it’s sigil on the face of its numbered cards. Clubs have the picture of the Direwolf from the House of Stark. Spades have the picture of the Crowned Stag from the House of Baratheon. Diamonds have the Golden Lion from the House of Lannister. Hearts have the Three Headed Dragon from the House Targaryen. The face cards have the portrait of different characters from each house and the front of the cards and the front of the box have the image of the Iron Throne. 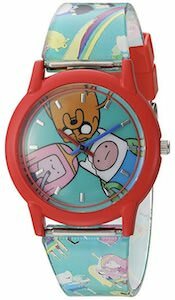 Are you an Adventure Time fan and love to play a good old game of cards? 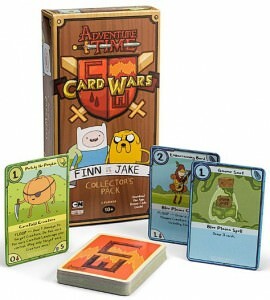 Well, with these cool Adventure Time playing cards you will have the best of both worlds. 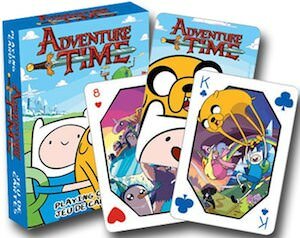 These awesome blue Adventure Time playing cards features all the characters like Finn, his best friend Jake, Marceline, Bubblegum Princess, Gunter and more. 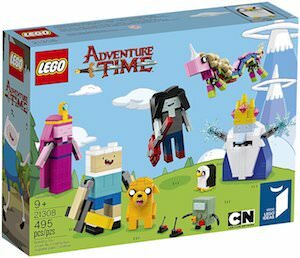 On all 52 cards shows them going on many adventures. 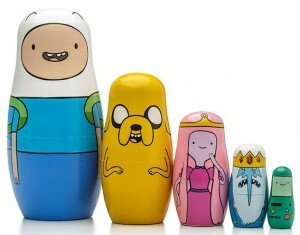 You will think your in the Adventure Time world with your friends while playing with the special deck of 52 cards. Fans of The Big Lebowski are gone enjoy this product. It’s a deck of playing cards based on the movie. The back of these playing card shows the Dude wearing glasses of witch the lenses seem to show the famous carpet. On the other side (the playing side) you will find a picture based on the movie. And this deck has 52 cards and each card has a different picture from the Big Lebowski movie. If you like to play poker like the Dude or just a different card game, this set of playing card can be perfect for you. 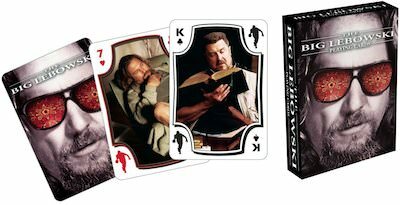 Now is the time to start thinking of you next playing card and maybe then can be these The Big Lebowski Playing Cards. 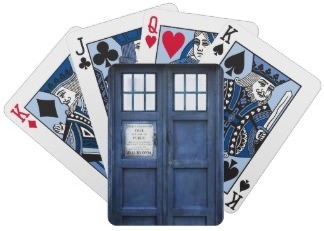 If you like the Doctor and a games of cards then you will like this set of Tardis playing cards. The cards comes in a normal 52 card deck and also has 2 jokers. The back of the playing cards have a picture of the famous Police box called the Tardis and that is uesed by Doctor Who to travel in time and space. As you can see even the cards have a blue color to make them match even better with the Tardis on the other side of the cards. If you like a nice game of cards on a cold winter night then come see this Doctor Who Tardis Playing Cards. If you like a good game of cards and a drink then you are in luck. 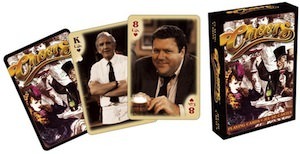 This is an official set of Cheers playing cards. 52 images of you favorite Cheers characters can be found on this 30e aniversary edition. And these playing cards of course have the official poker size so that you can play the game you love most while thinking back of your favorite TV show Cheers. Come check out these Cheers Playing Cards. Now you can play cards with special cards. These are cars cards. And they of course have Lightning McQueen and other cars from the movie on it. 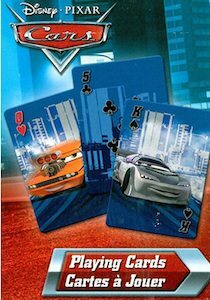 These Cars playing cards are the regular poker size so that you can play the card games you want to play. Come check out these Cars Playing Cards. If so stop using those boring playing cards and replace them with something special. How about these Star Trek playing cards? These cards come in a special storage tin that says “Beam Me Up” and has Captain Kirk on it to. So now you card games will be so much better as everyone wants to join in to see those amazing Star Trek playing cards. 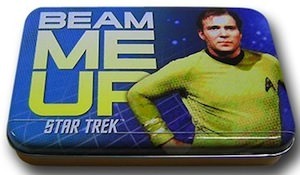 Get ready to play cards with you own Star Trek Playing Card Set In Collectors Tin. 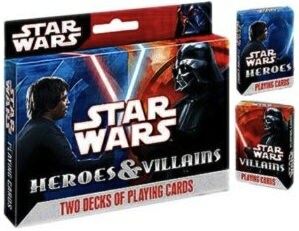 With this 2 deck set of Star Wars playing cards you are ready for a serious game of poker. This set comes with two decks one with the good guys from the Star Wars movie on it and one deck with the bad guys on it. Of course this is the set for a real Star Wars fan and something that can’t be missing in your collection.